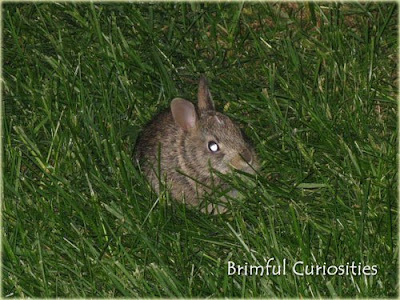 Brimful Curiosities: Wordless Wednesday - Peter Rabbit? Guess who lives in the hosta plant just outside the bedroom window? A baby bunny. Actually make that two baby bunnies. The kids check the view from the window each day to see if they can spot one of the bunnies eating the grass. I'm OK with the bunnies' residence for now, so long as the bunnies (a.k.a Peter and Rabbit) stay out of Ms. Brimful's garden. How cute. We had baby bunnies nesting in our flower garden this spring. Unfortunatly 2 of them didn't make it. We have bunny fencing all around our yard. Nevertheless, they are always trying to break in! They're cute but very very pesky! What a cute little guy! We have seen a bunch of rabbits hopping across the roads lately! I might be ok with a bunny in my garden compared to all the crickets and ear wigs there are..eeww! Awww, how cute! Now I have that song "Here Comes Peter Cottontail. . ." stuck in my head! How cute! We have tons of rabbits around here, but strangely I haven't seen any babies. I love baby bunnies! Too cute! We love watching the bunnies in our yard too. Too cute. They are adorable, but wow, can they do some damage! Awww...what a fun little visitor!